General Motors Canada is helping Hot Wheels celebrate its 50th anniversary next year by giving toy lovers the chance to purchase a full-scale model of their own. The automaker on Thursday confirmed the 2018 Chevrolet Camaro Hot Wheels 50th Anniversary Edition will eb available in Canada. The car was unveiled at an event Wednesday in California ahead of its public debut alongside 20 or so other Chevy models at the 2017 SEMA Show, which runs Oct. 31 through Nov. 3 in Las Vegas. U.S. availability of the special sports car was immediately announced after the unveiling. GM Canada told Automotive News Canada on Thursday that Canadian details are forthcoming, as early as Thursday afternoon. The U.S. package pays homage to Hot Wheels features including unique badging, a "Crush" exterior colour and stripes that replicate the toys' famous orange tracks. It will go on sale in the United States in first quarter of 2018 as a US$4,995 option on the Camaro 2LT and 2SS coupe and convertible models, which start at US$31,500, including shipping. Canadian pricing has yet to be announced. "The Chevrolet Performance design studio is full of designers who were inspired by Hot Wheels," Tom Peters, director of exterior design for Chevrolet Performance Cars, said in a statement. 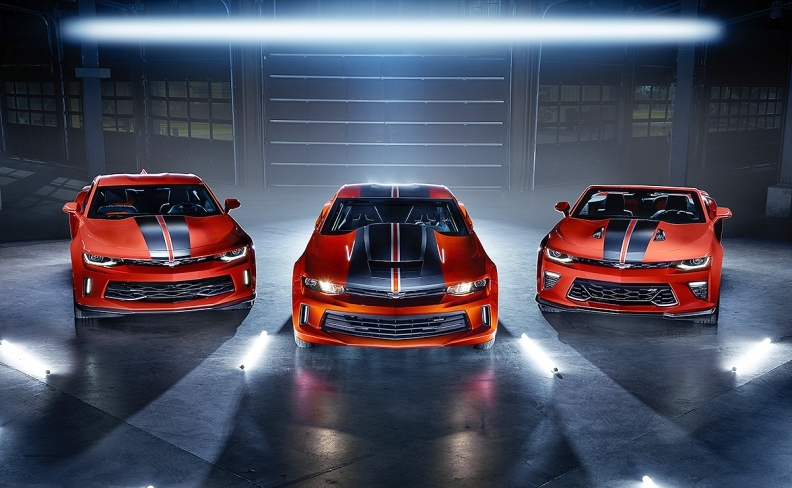 "The Camaro Hot Wheels 50th Anniversary Edition captures that passion, turning childhood fantasy into reality."